SLF’s Irish Jig came to us just before the 31st of January, 2008 — the 27th to be exact. It was a beautiful Sunday afternoon, perfect for horse moving. 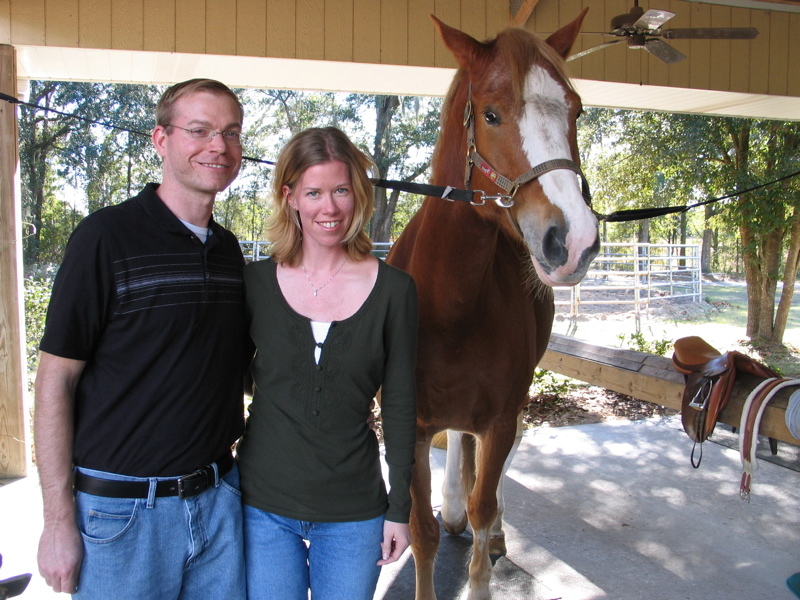 My friend Kaite met Andy, Stacey and I at a local boarding stable where Irish was living at the time. Kaite’s friend, Dawn, was gracious enough to also meet us there with her trailer to help us with the move. What a big day! 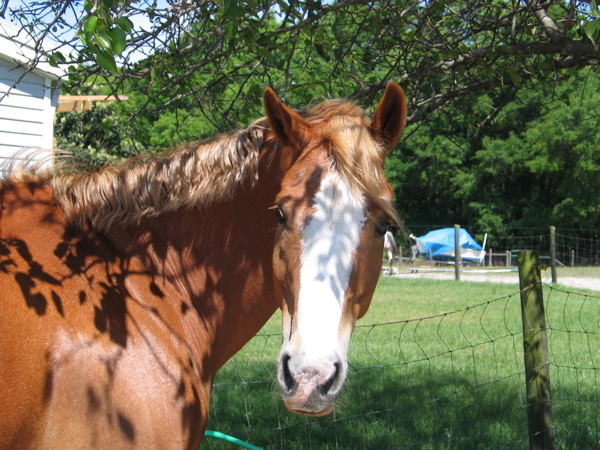 We were bringing home our very first horse together and boy was Irish handsome. We first packed up all of his stuff in my truck, then got his shipping boots put on him for safe travel and he was all set. He walked right onto the trailer with no problems and though the trailer was a little too short, he managed just fine for the few miles we brought him. 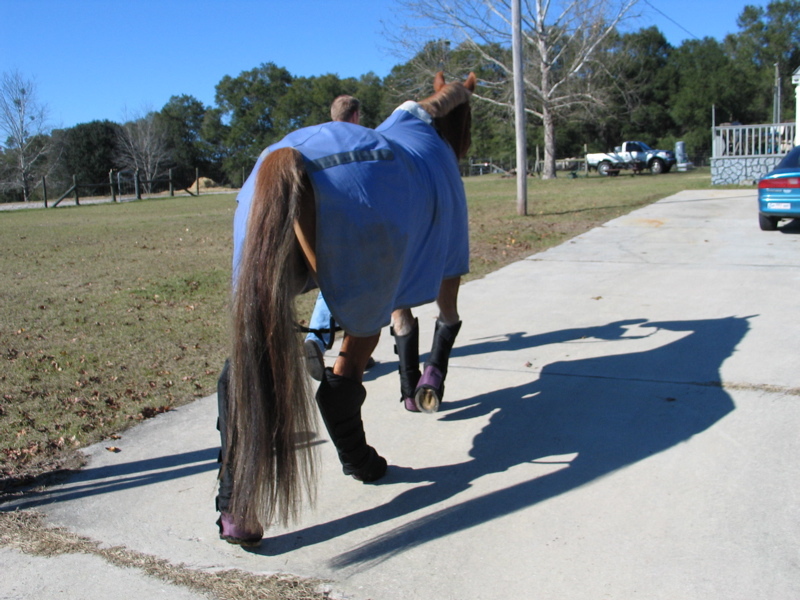 Once we arrived here at our farm, Irish walked off the trailer as if he’d been here forever. He looked around and walked with us right to where his stall was… this was old hat for him since he’s been to so many shows and has experienced being in different environments before. Irish settled right in. 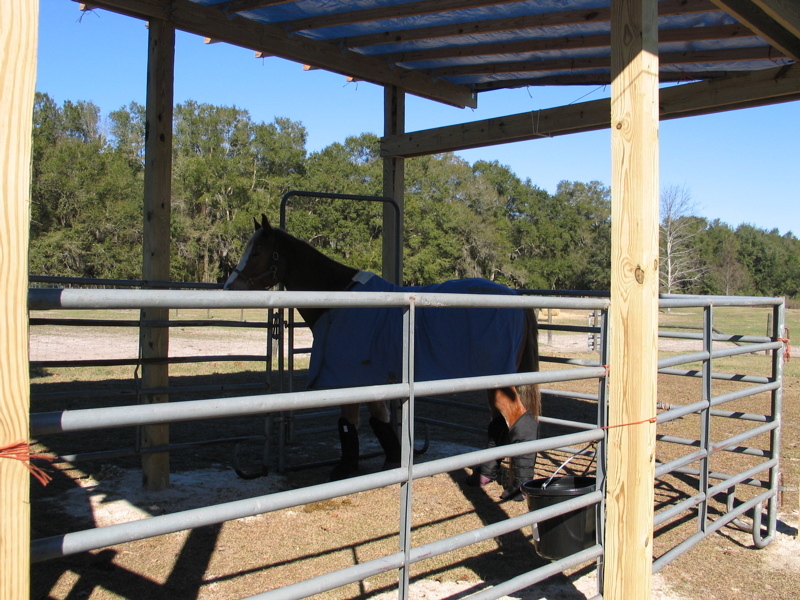 At first he had to stay on stall rest so that his leg would continue to heel…so he stayed in a very nice 16 x 12 stall we built for him. (Thank you Kaite for loaning us the pen panels and thank you to everyone who helped us build the roof). He loved being the center of attention, right in our backyard and quickly got to know Dakota (our dog) who frequented his stall. Andy very quickly learned the new duty of picking a stall – something we don’t normally do since our horses are on pasture. Irish longed to be with the other horses. March 11, we finally got the “OK” from Dr. Lacher of Springhill Equine Clinic that he was well enough to go out into the roundpen, then to pasture in a week and he was ready for work. So his first try at friendship was with Damien… a horse who is very sweet and who could truly care less whether he has a friend or not so he pretty much left Irish alone. This meant no running around or drama which was exactly what we wanted…. 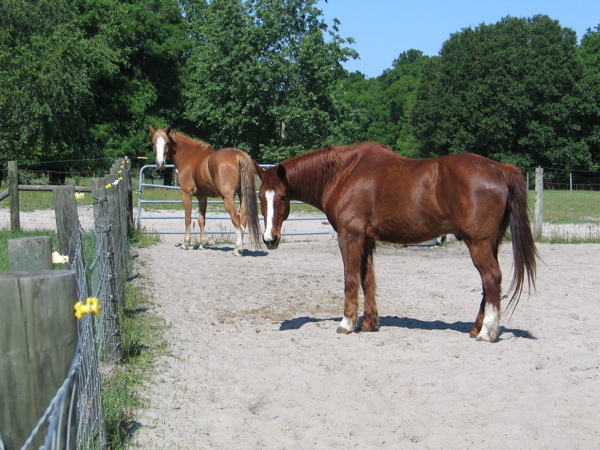 Since then, we have moved the horses around so all of the boys (except Astar) are together – Munchkin, Damien and Irish, who has made himself quite comfortable with the other horses. We found out pretty quickly who was top horse (Irish) and are happy to see that he has settled in so well with the boys. We’ve been riding him more these days (Andy more than me) and he’s doing wonderful! He’s still getting back in shape from being on rest for so long, but he’s getting there. He’s even been integrated into my friend Kaite’s riding lessons =) and seems to really enjoy the work. He’s always happier after having been ridden and looks forward to it every week. We’re looking forward to many more years with Irish as part of our family. He’s definitely here to stay.